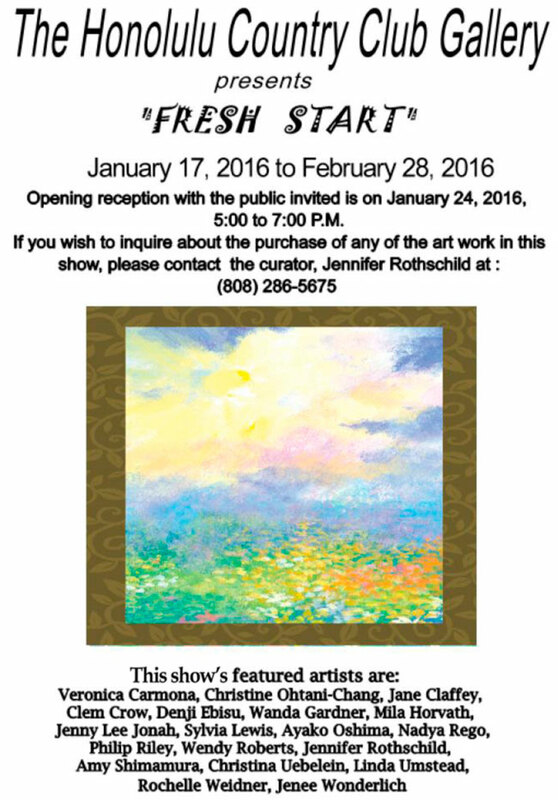 I was awarded first place in the “Fresh Start” show at Honolulu Country for my painting of “New Day at Kawainui”. My sincere thanks to the curator, Jennifer Rothschild, for organizing the show, and to the jurors. 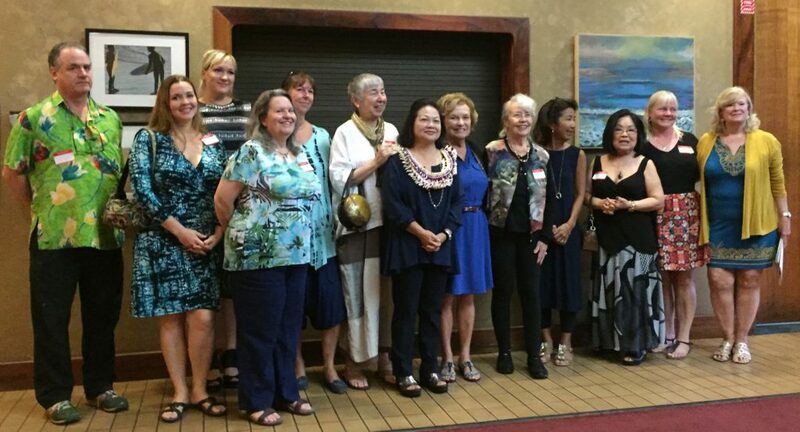 The show stays up for 6 weeks, until February 28, 2016 at the Honolulu Country Club. “New Day at Kawainui” is my latest work. I received an invitation to participate in a show at the Honolulu Country Club. The theme resonated with me. It is entitled “Fresh Start”, and since I have always been a believer in the power of setting goals at the beginning of each new year, this is an exciting concept to me. I immediately thought of the golden mornings on my walks. Kawainui is a place where I occasionally go to walk and to clear my head. It signals change and new beginnings to me. I had been thinking of painting it, but this was the perfect time to move this concept to the front of my queue. The invitation was a little bit of a short notice, but I wanted to create a piece based specifically on the theme, so I decided to try and see if I could paint it in time for it to dry, knowing that oil paint was definitely not a compromise. I needed its true color to portray the vast distances of the scene. 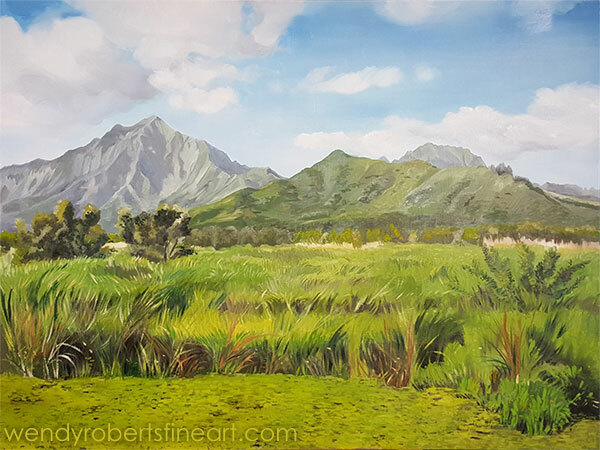 “New Day at Kawainui” is a triptych in progress. Some paintings are so consuming that it is impossible to take them at a measured pace. This triptych was a frenzy, a compulsion – not just because of the deadline either. I really wanted to complete the concept while the year felt young and new. I worked with every moment I had and at a level of attention that I could not hope to sustain long term. I completely surprised myself with the pace of my progress. I finished the center panel, and the other two panels are complete except for the most minute adjustments and finishing touches. The piece as a whole is yet to be unveiled, but each piece of the triptych can stand alone, so the center panel is my offering to the “Fresh Start” show currently on display at Honolulu Country Club. 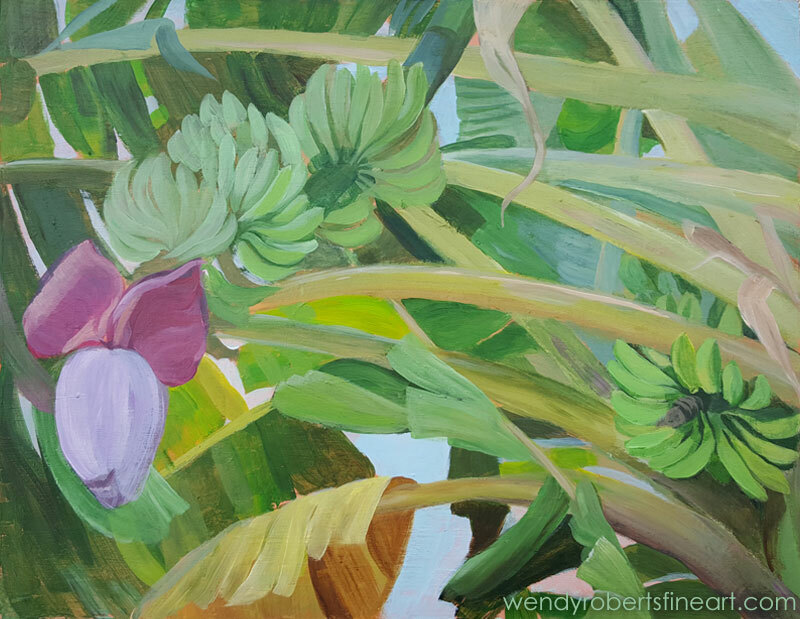 Also in the show is a piece that has been in a couple of other shows, “Ripening Bananas”. It fits the theme of a Fresh Start, so it is also on display as a botanical interpretation of the theme. I love painting bananas! They are such a visually interesting plant! I am glad I am taking my time to display the other two panels. Had I rushed the drying, I might have compromised quality or done something to endanger the long term archival outcome. I have heard of painters doing many things to try to make an oil paint dry more quickly. I was toying with the idea of trying to speed the drying, but was unwilling to do anything to endanger the piece. An online search demonstrated that oil has to take its sweet time. Techniques for speed-drying included painting most of the painting with acrylic and then using oil paint on the top layers (which leads to chipping later on), placing the piece in the oven to try to warm the paint (which can warp the wooden supports or even set on fire if there are flammable thinners on the piece), or adding liquin, which may yellow over time. If I have one piece of advice for anyone who might be wondering about how to make oil paint dry faster, I would tell them to stop and let it dry naturally. Take your time and produce quality. Oils are about subtle color – they stay true and do not dry darker like acrylic, so if you need to create a piece with these advantages, there is no short cut. It has to have time to dry. You can work with acrylics if you need something to dry quickly. Paint your oil painting and assure it is dry to the touch prior to display. Wait 3 months in our humid Hawaiian climate to add the varnish. It’s hard sometimes to wait, but it’s worth it for the quality. There is also no shortcut for quality work. Often, the particular piece dictates its own schedule. In my own sprinting pace for this piece, I got a lot done quickly, but it was because I was able to pack so many productive hours into the day on a piece that had a clear goal, not because I rushed the process or cut corners on the finishing details. I managed my attention span carefully with well-placed walks, housework, and family time when I would get mentally fatigued. And I utilized coffee to bring my attention to lazer focus when possible but if my work quality started to decline, I set the brush down and took a break. The ultimate goal is to make something that will last and bring emotion to the people who purchase art. It is important to treat the calling as an artist as a challenge to perfecting craftsmanship so that the longevity of the painting is assured. There is less than one week left to see the Convergence Show at Gallery on the Pali. The Gallery on the Pali will be open between 10 and 6 pm on Tuesday, Wednesday, and Thursday this week. We will take it down this upcoming Friday morning, January 8, 2016. Leo Hura documented through the lens of his camera – very nice of him to share! Thanks Leo! Please note that the names of my fellow artists should read: Dawn Yoshimura, Suzanne Barnes, and Cynthia Schubert. Three extremely talented artists! It’s been such an honor to work with them!